« Rebel Mage offers free ports. 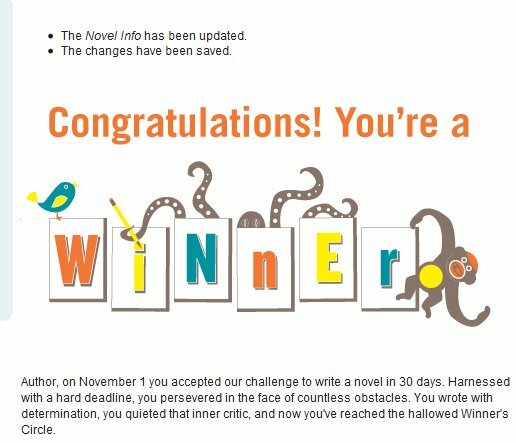 Yes I am a 2010 Nanowritmo Winner.. what do I win, well it’s not what you win that counts ( nothing really other than the knowledge that I am awesome)** This also means more blogging, and just for your torture enjoyment I have a post already written to post after this one so this can be skipped if you’re not interested. I could cry. It was hard, and easy. It’s the journey and I am tired, and I have icecream in the freezer as a reward, but routine, and lots of little goals made it easy to obtain. I have discovered I write best when I am not at home. I tried it over the weekend. First I needed a better chair because my ottoman was too low for the dining table, so I had to use a dinning table chair, then I needed coffee, and had none, so I had to use two chi latte sticks from a box I had bought for fussy guests, then I felt like chocolate, then the cat tried to jump on the laptop, then I wanted a glass of water… check my email.. laptop wanted to do a diagnostic, then it wanted to update something, then I had to pick a song to listen to while writing. You can see from my graph that I kept on and just above my goal for most of the ride. The flat bits are weekends where I needed to have a break, and not think about it. The word count is strange. 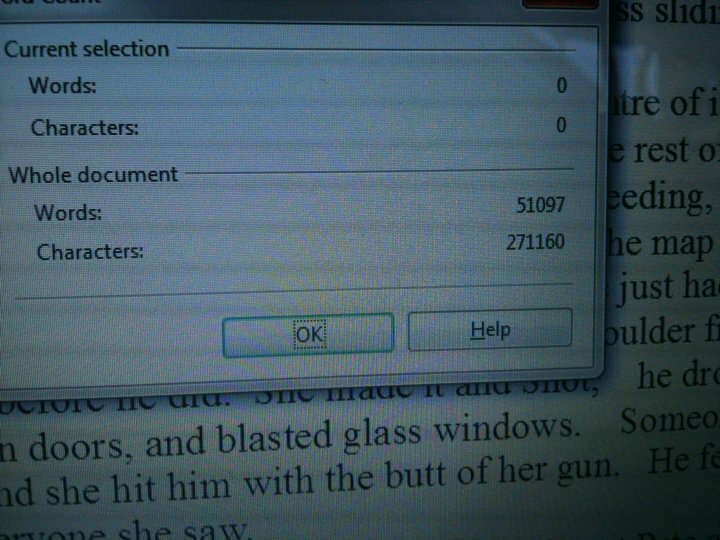 Open office said it was 51097 as above, word says its 50,591 and nanowrimo’s verifier thinks its 50627 so I AM CONFUSED. But three different word counts says I did it.! ** Awesome only for the purpose of meeting this goal. Different word counts will choose to include/exclude articles and/or proper nouns sometimes. I do not spent enough time staring at either applicance to ever consider wanting net access on them. My popcorn maker is getting more eyeballing then my washing machine. Throw in clothes, close door, put powder in the right slot. Turn nob for right cycle, and press start. Pop corn machine gets alot more staring because it’s noisey and fun to watch the corn explode. Grats on the winner status.. but then you were already a winner to me! Maybe one day I will try and write more than 500 words… then again, I dare say my readers would be happy enough if I wrote 100 occasionally. Gnome you manage to pump out alot more then 100 words often, including some rather epically important ones. 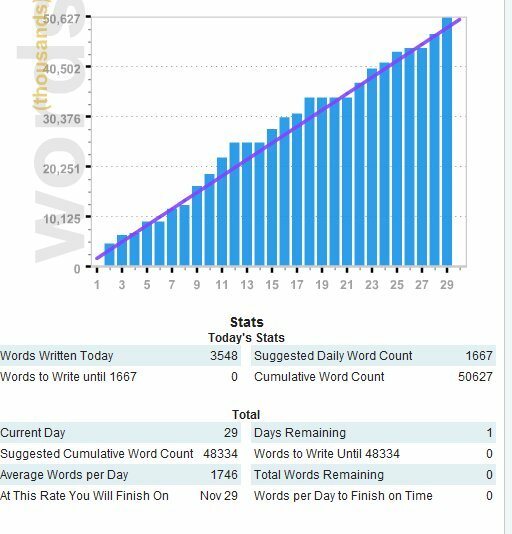 As a person who tried my first NaNoWriMo this year…and made it exactly 6 days; I salute your achievement. Holy crap writing that much EVERY DAY is very hard on the brain, and takes a lot of discipline. Kudos. Yes. There were times I didn’t want to keep going. My 1st time only lasted about 6 days, maybe nextyear for you!